Bamboo is a special plant for gorillas, golden monkeys, and people too! 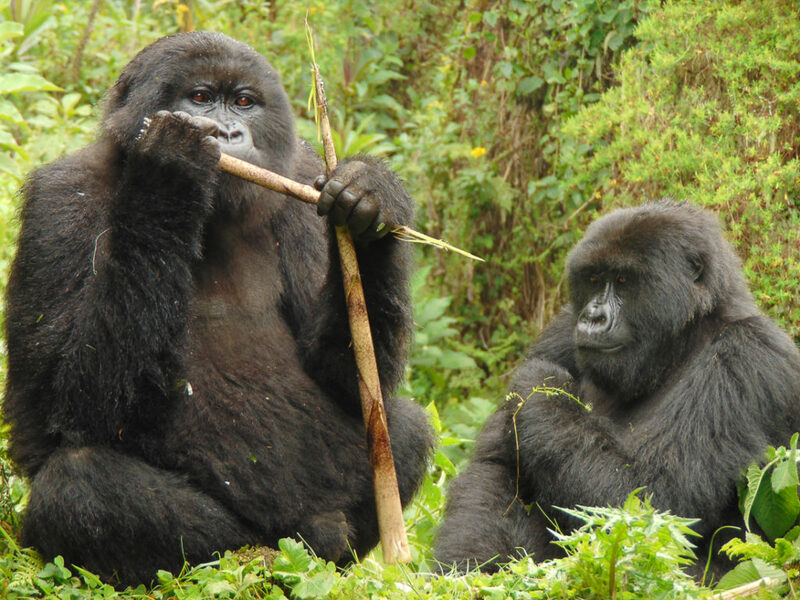 At the Fossey Fund, we have been studying bamboo in relation to mountain gorillas for years, because it’s one of their favorite foods. 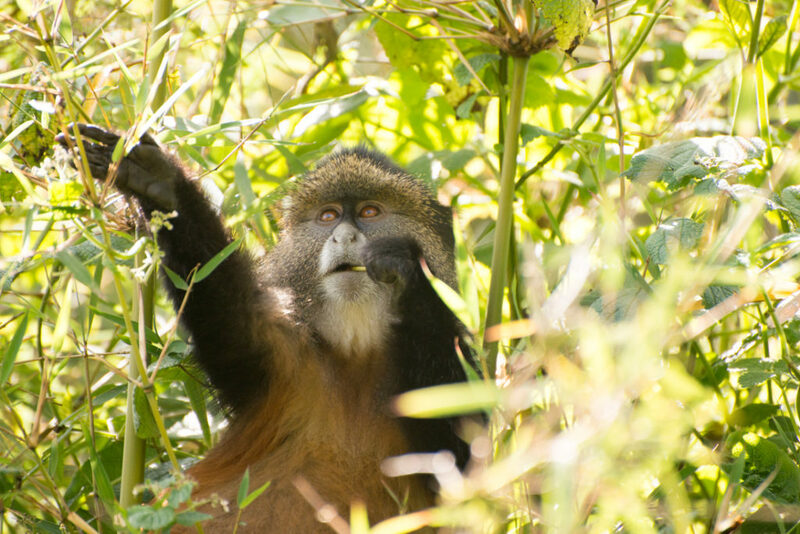 Then, when we started our studies of their forest neighbors – the golden monkeys – we realized that those primates really depend on bamboo and build much of their lives around it! And of course bamboo can be important to people too, since it’s useful in creating all kinds of eco-friendly products. So we think it’s safe to say that we all love bamboo and that bamboo can play a big role in biodiversity and conservation in many ways. Mountain gorillas love to eat bamboo shoots, which are produced during two seasons each year in their habitat. Bamboo grows in the lower altitude of the park, which attracts gorilla groups to come down and feed close to – or sometimes outside of – the park’s borders. Right behind them are our research staff, collecting data to learn about the plant’s dynamics as well as the relationship to the gorillas’ ranging patterns. During each bamboo shoot season, our staff visits nearly 90 designated plots in mountain gorilla range every two weeks, to measure the number of bamboo shoots and mature plants, how many have been eaten, weather conditions, and other data, all to look for trends and compare to previous years. 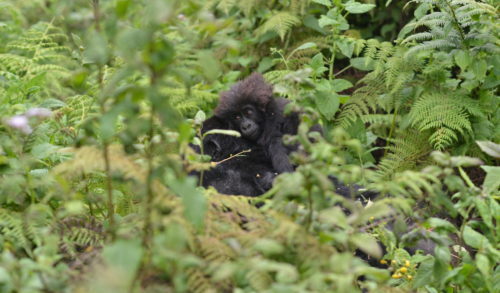 Some years are better than others, and we closely observe how this affects the gorillas’ movements. 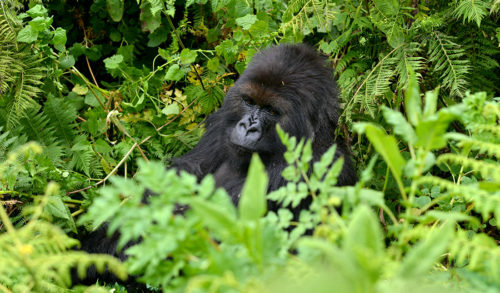 Luckily, gorillas eat many other plant species too – up to about 200 types – so are not dependent on bamboo. 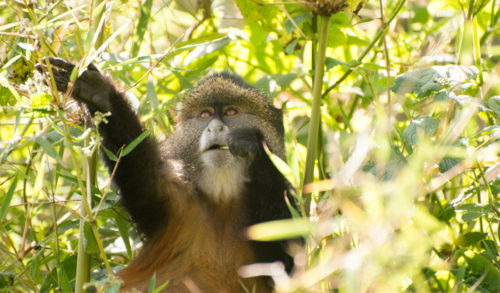 Bamboo is located in the main habitat zone of the golden monkey, and is observed to make up about 70 percent of their diet, so they are much more dependent on this plant than the gorillas are. 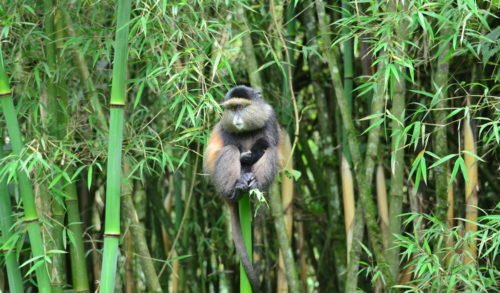 In addition, golden monkeys give birth during bamboo shoot seasons, the main availability of this high-quality food. This means golden monkey mothers will be well fed and have a better time producing milk for their young. 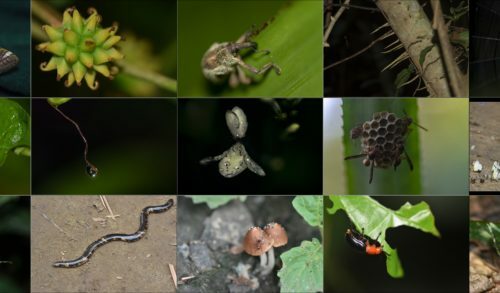 Our researchers now monitor 28 plots in golden monkey range every two weeks during bamboo shoot season, so that we can continue to learn more about this critical relationship. Bamboo can be grown and used in eco-friendly ways to make many things, ranging from furniture to clothing to utensils and more – the possibilities are almost endless. But since bamboo cutting inside the park is not allowed and harms the habitat there, it is better to have bamboo for human use grown outside the park in farms. This can help generate income for local communities, which is hard to do with many other crops. 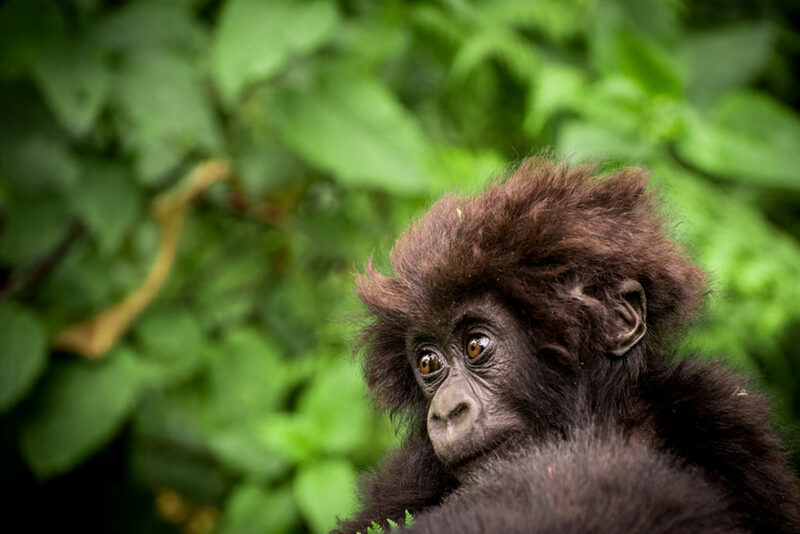 The Fossey Fund has recently started working with two local cooperatives in villages near the park on a pilot bamboo project, in conjunction with a local Rwandan organization. Together, we will help set up bamboo nurseries and begin incorporating additional people into the project by teaching business and project management skills, as the bamboo begins its two-three year maturation process. 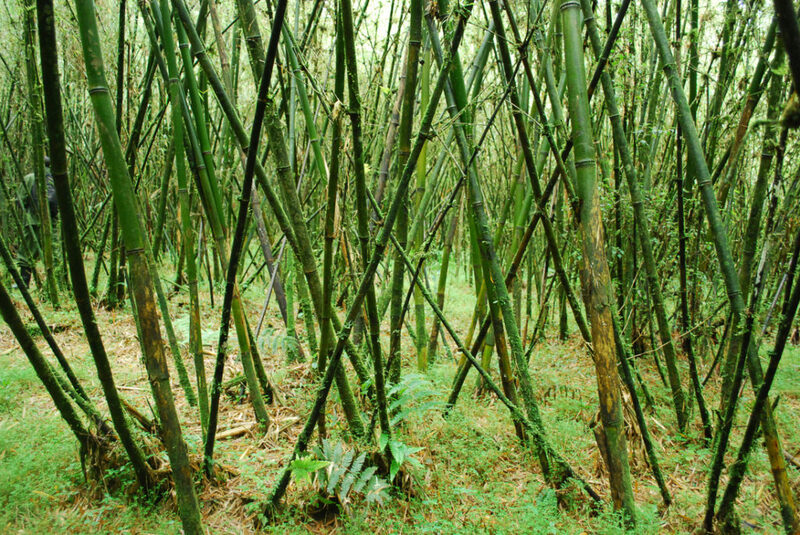 So maybe one day there will be a whole new economy built around bamboo in this area, as both animals and people benefit from this versatile plant. This will be especially useful in Rwanda, which is proposing a two-year phase-out of single-use plastics, meaning raw materials that are recyclable will be needed to make many items – like bags – that were formerly made from plastic. Another famous endangered species that depend on bamboo? Pandas, of course.